Deep Sea Treasure Slots - Review tips to win big! Step 1: In order to place your bet in Deep Sea Treasure Slots, click on the stake up or stake down buttons to increase or decrease your bet. Step 2: There are twenty pay lines activated in Deep Sea Treasure Slots, and these pay lines cannot be altered. Step 3: Clicking the green play button will commence play, whilst the red auto play button will keep your stake set at the given amount for any future plays. 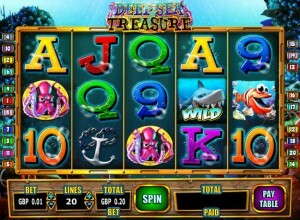 Dive to the depths of the deep sea for hidden treasure with the ultimate underwater slot experience, Deep Sea Treasure! With 5 reels and up to 20 paylines there are tons of ways to CASH-IN big wins with every spin. Increase your paylines to up your odds of reeling in a huge pile of deep sea treasure! Keep an eye out for “wild” sharks who payout the biggest bites of cash at a rate of 10,000 times the active payline bet! Also keep your goggles clear for the friendly “Puffa Fish” who activates free spin bonuses when three or more “Puffas” appear in any combination. Unlock the Treasure Chest to uncover a multiplier and watch out for the Octopus bonus feature! Dive all the way in to Deep Sea Treasure Slots for BIG WINS, FAST CASH and boatloads of FUN!